The definition of a workshop building is pretty self-explanatory. It is a place where you go work and get things done. Maybe you can enjoy repairing things, do a little woodwork, or maybe you just need somewhere for all of your tools. D Cross Barn Co. has what you need. Our goal is to help you create a practical, but productive environment. For the first consultation up until your workshop its completely built, our barn professionals are with you every step of the way to ensure your satisfaction of the progress and results. Another reason we hope you’ll consider us for your workshop needs is our 35 years of experience in the housing in construction industry. Our goal is to give you the most value for your money. D Cross Barn Co. is among just a few barn builders I will pour concrete slabs and driveways instead of you having to make your own arrangements. With one less subcontractor and third party involved, the process of building your dream workshop is more efficient and seamless. Workshops are typically a max of 24 x 30 to 40 x 60 and feature and entrance door and one garage door, however this is just a guide in the options are endless. The features of our workshop buildings include open, flexible floor plans so that you can make use of the space in whatever way you like. If you have other buildings on your property that you want your workshop to compliment your current structures, we can do that. 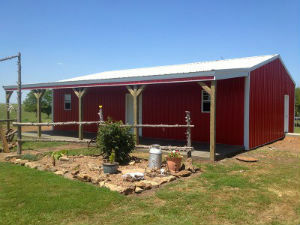 We know that you have a dream in your head of exactly how you want your custom barn. We plan to turn that into reality for you. Call us today!